OST KYC is the first plug-and-play KYC/AML management solution for token sales. Process thousands of applicants smoothly and securely. Developed for the Simple Token "OST" ICO. Now available for any company to use. Easily run your ICO with our complete KYC/AML management solution. Ensure a smooth, safe, and secure whitelist experience. Leverage our back-end tools to manage applicants, process change requests, and comply with legal requirements. As a part of the OST KYC experience we provide a customizable front-end, where your future token holders can register and submit their details for your token sale. OST KYC is compliant with GDPR, which means the personal data is handled according to data privacy laws across all EU member countries. OST technology is SSL protected and two-way encrypted. Audited by Cure+53. Integrated assessment of anti-money laundering, counter-terrorism financing and risk assessment backed by Acuris Risk Intelligence. Whitelist the ETH adresses your customers provide during registration and allow them to safely purchase during your ICO. 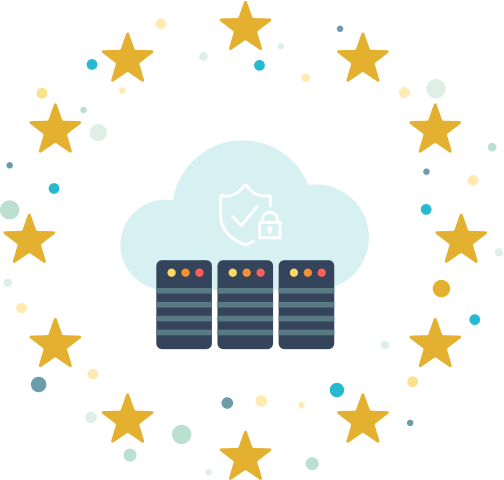 OST utilizes the European information protection orders as the gauge for its information security compliance internationally. Effective May, 2018 every single important advance to fulfill GDPR compliance have been accomplished. OST’s information security compliance program is appropriate to all classes of individual information, including personal data, document ID and whitelisting addresses. 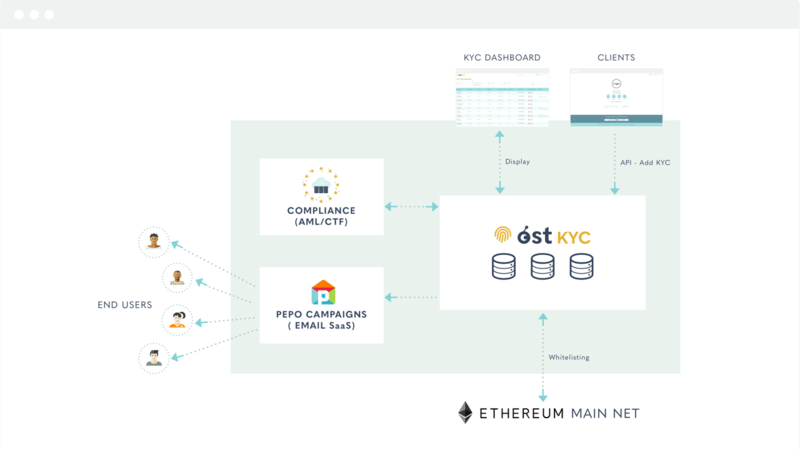 This segment includes an entire detailed overview of OST KYC's system architecture and OST KYC's Admin Dashboard Features. OST KYC's API Documentation gives you flexibility and ease to integrate your own front-end by using APIs with OST KYC admin dashboard. 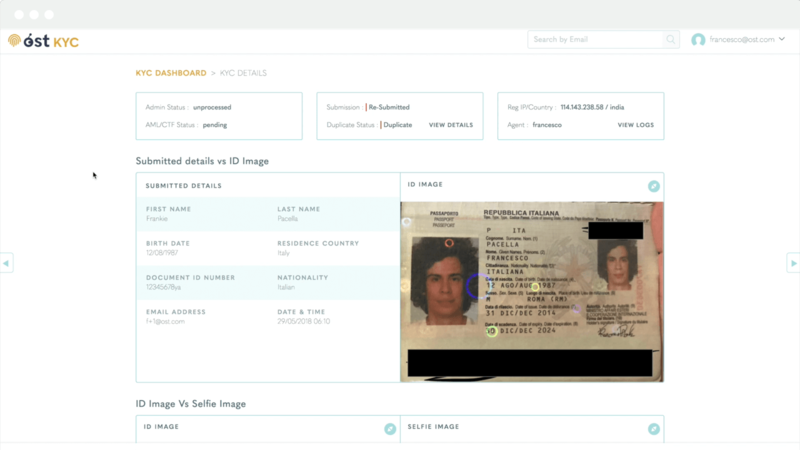 OST KYC's experience includes customisable front-end development, where KYC users can submit their data and upload their documents. Explore the OST KYC system architecture and components. Discover the seamless experience you can offer to your future token holders. 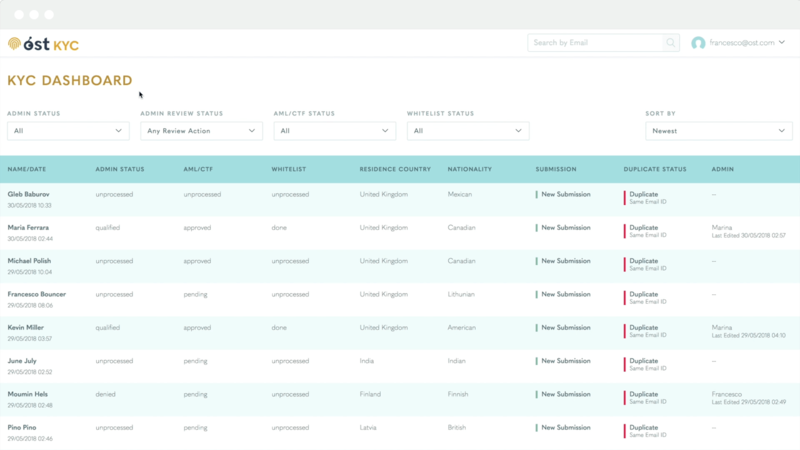 Learn how to utilize the OST KYC admin dashboard to easily manage thousands of applications. 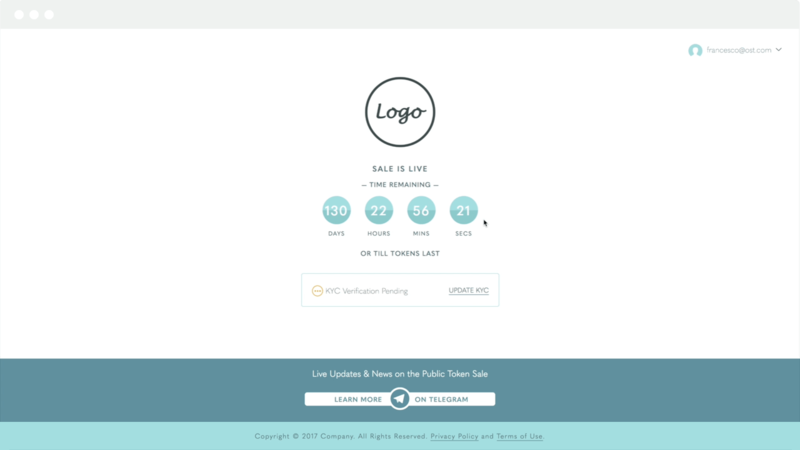 Learn how to review, approve, and resolve issues to grant customers access to your token sale. Enjoy tech support & ICO advices throughout the setup and execution. Two-way encrypted and secured server that ensures access just to you. 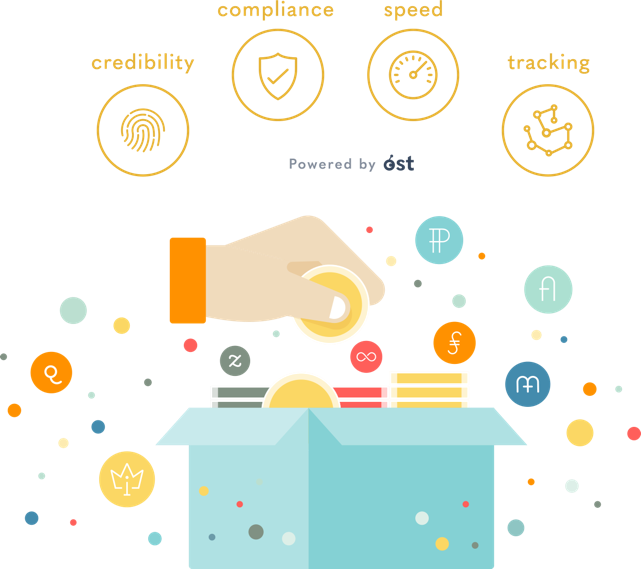 Purchase OST KYC with $OST and get the most convenient price on the market. Leverage on our 10+ years UX experience to optimize users and admins conversion. Quickly and safely process and verify thousands of customers every day. Activate and manage unlimited admins and lead your team to success. OST KYC is a complete solution for ICOs Know Your Customer (KYC), Anti Money Laundering (AML), and Counter Terrorist Financing (CTF). Only with OST KYC you can Whitelist your customers Public ETH Address directly in your Smart Contract. How long does it take to have the OST KYC solution up and running? As soon as all the required details for setup are provided from the client side, on average it is requiring ~1.5 days to have the dedicated sandbox environment ready. From there, once all is verified from the client side, it is easy to move to production and start the ICO. Please tell us about your company and the goals of your planned token sale. We have received your request and our team will get back to you very soon.